Scientists have known for decades that black holes exist, but only indirectly. Three years ago, they essentially heard the sound of two smaller black holes crashing together to form a gravitational wave. The image revealed Wednesday showed the edges of the black hole — called the “event horizon” — for the first time. The new image shows a glowing ring that was obviously a black hole and its surroundings, said Harvard’s Sheperd Doeleman, director of the Event Horizon Telescope team. Each major astrophysics discovery of the last few decades tends to confirm Albert Einstein’s general theory of relativity. It’s a comprehensive explanation of gravity that the former patent clerk thought of in 1915 before computers and with much weaker telescopes. It sounds strange to keep saying Einstein is right, but every time his general relativity theory is confirmed, “we kill a cloud of alternative theories” and gain better understanding how to create an even more comprehensive theory of physics, said Ethan Vishniac of Johns Hopkins University. He wasn’t part of the discovery team. 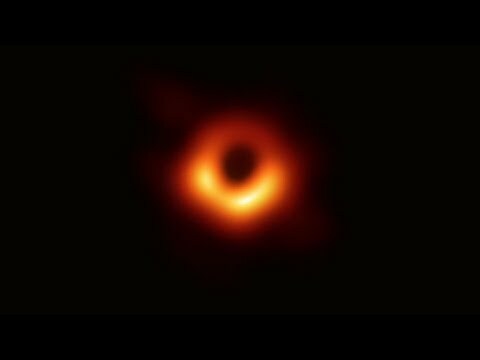 The black hole that scientists took a picture of is in the center of a galaxy called M87 and it is far bigger than anything in the Milky Way. Its mass — the chief measurement of a black hole — is 6.5 billion times as much as our sun’s. The event horizon stretches about the breadth of our solar system. “M87′s huge black hole mass makes it really a monster even by supermassive black hole standards,” said Sera Markoff, a discovery team member at the University of Amsterdam. Black holes like these “temporarily become the most powerful engines in the universe,” Markoff said. Those images were so good that scientists at first worried that it was just too good to be true, Boston University’s Marscher said.